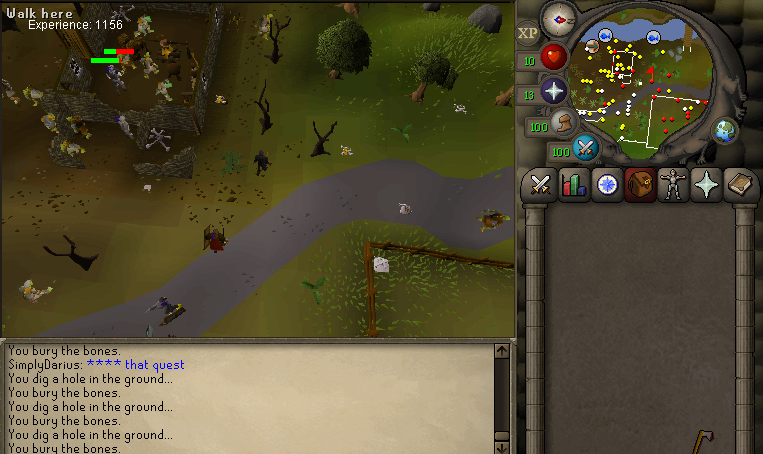 Start in Lumbridge near the goblins, preferably on a world that has a lot of people. Buries all bones in inventory. Find closest bone and buries straight away. If next bone behind door / opens. Disclaimer: This is my first script, while I haven't found any bugs. Please report them so I can fix if you find any. Fixed Paint to display experience gained. Fixed issue with script not starting correctly. To enable running if energy full. Open nearby doors, if bones are inside. I've updated the script and it now works correctly. Pending update. It's bugged right now. It gets stuck if it tries to pick up a bone behind a closed door, and continuously ends up south the fence of east cow farm. I assume it is trying to pick up the bone in the farm but cannot, even when the cow door is open.